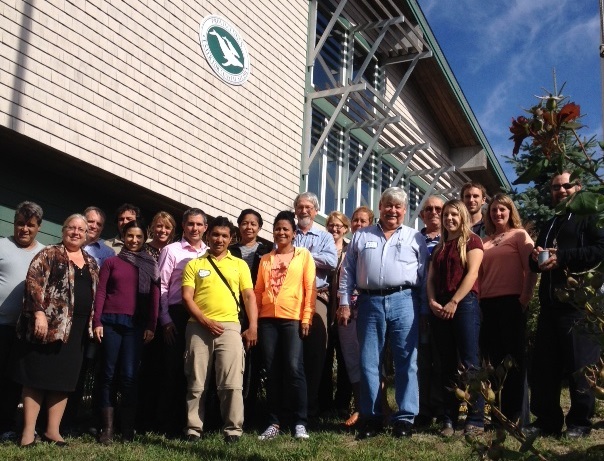 A recent example involved a delegation of seven Cuban fishery managers, scientists and industry leaders joining four EDF staff and two partners from the Mexican organization COBI at the Center for Coastal Studies (CCS) in Provincetown, Massachusetts, at the very end of Cape Cod. There, the group had wide-ranging discussions of experiences, challenges and successes in improving management of marine resources. The workshop had a particular focus on better use and integration of spatially-explicit science and management tools. These include protected areas, area-based allocation systems (e.g., territorial user rights for fishing, or TURFs), and multi-use planning zones. We also paid close attention to the governance structures needed to ensure effective, responsive and participatory management. Cuba boasts some of the most vibrant and intact marine ecosystems in the Caribbean. However, with increased fishing pressure and demand for seafood on the rise, overfishing has become a significant problem. Cuban scientists estimate that more than 40% of ecologically and commercially important fish species are overfished, which poses a major threat to Cuba’s fishing communities, food security and biodiversity. To reverse this trend, resource managers, scientists, fishermen and community leaders are looking for new ways to sustain their fishery resources while also protecting jobs and improving livelihoods. EDF is now working with Cuban partners on an ambitious community-based project aimed at protecting coral reefs, ending overfishing, and sustaining fishing communities along Cuba’s south coast. CCS was a fitting venue for the workshop because the organization has contributed to research, monitoring and policy for the nearby Stellwagen Bank National Marine Sanctuary (SBNMS). SBNMS is a point of convergence of fisheries, shipping, recreation, tourism, protected species conservation, and other important ecosystem services. This creates challenges in balancing competing uses, but also opportunities to develop novel and collaborative solutions to resolving those conflicts. CCS plays an especially important role through its efforts to study, track and rescue endangered humpback whales and northern right whales. The workshop participants took a midweek break to see the fruits of those efforts during a whale watch out to SBNMS, compliments of Provincetown’s Dolphin Fleet. In fact, the role played by CCS is so important that Maeve Vallely Bartlett, Secretary of Energy and Environmental Affairs for the Commonwealth of Massachusetts, was meeting with CCS President and CEO Rich Delaney about the organization’s work on the day that the workshop commenced. Secretary Bartlett and Mr. Delaney welcomed the workshop participants to Provincetown, after which a series of guest speakers shared experiences from New England and elsewhere in the U.S. The Cuban and Mexican visitors shared their own experiences as well, which fostered stimulating discussions about how the lessons learned in each country can inform its neighbors in confronting their own challenges. A group of Cuban fisheries and conservation practitioners meeting with counterparts in New England on Cape Cod might seem like a somewhat counterintuitive gathering. However, the same whales that delighted the group during its trip out to SBNMS spend the winter months on calving grounds off the east coast of Cuba. Also, many of the ospreys that signal the arrival of spring on Cape Cod, not to mention inspired the birth of EDF, migrate through or overwinter in Cuba as temperatures drop in New England. So, there are important ecological connections between these distant and seemingly different places. But the workshop revealed that Cuba and New England have many other similarities that allowed for a valuable exchange of ideas. Both are looking at spatial management as part of a comprehensive strategy to end and reverse overfishing. However, fishermen in New England and Cuba have different views on the efficacy of spatial measures, with some strongly supportive and other strongly opposed. However, both also have increasing needs to manage a growing variety of ocean uses beyond fishing in their marine waters. Integrated management of fisheries and other ocean uses needed to address these conflicts in Cuba and New England is incomplete, but improving. This entry was posted in Cuba, International and tagged collaboration, Coral Reefs, Cuban embargo, fisheries exchange, Marine research. Bookmark the permalink. Both comments and trackbacks are currently closed.